LAKE FOREST, IL--(Marketwired - Jun 2, 2016) - MLG Chicago today announced the Grand Opening of its restaurant, located in downtown Lake Forest at 181 E Laurel Avenue. The 150-seat restaurant reflects inventive, new American cuisine in a swanky, upscale environment with a vast collection of wines, cocktails and rotating artistic masterpieces. The restaurant evokes the perfect fusion of ART + FOOD + WINE personally selected by owner Marcus Lemonis, entrepreneur and host of CNBC's hit reality series, The Profit. The restaurant was formerly known as The Grille on Laurel, but has since been renovated and rebranded to reflect the community, and redesigned with a brand new bar and menu while keeping many of the old classic dishes that made The Grille a staple in Lake Forest. At MLG's, the menu showcases the natural flavors of the freshest ingredients, and all sauces, dressings, and desserts are house-made. Menu offerings include everything from bar fare, such as sandwiches, burgers, fries and homemade pizza, to higher-end cuisine such as seafood, steaks and chops, among a variety of flavorful healthy options. Diners start with a selection from the appetizer menu, including selections such as Chopped Brisket Sliders, Margarita Flatbread and a Charcuterie Board, or can choose from the sumptuous Calamari or Jumbo Shrimp Cocktail. Enjoy soups such as French Onion, New England Clam Chowder or chilled Gazpacho, while the season's bounty is also showcased in salads such as a Cobb Salad, Nicoise Salad with a Champagne Vinaigrette, a signature Simple Greek Salad, or a Miami Mandarin Salad with goat cheese. "The cuisine and atmosphere at my new restaurant goes beyond everything I have ever created," said Lemonis. "I am introducing a new concept and food preparations that take Lake Forest dining to a new level and I invite community members to join our soft opening, Thursday, June 2nd at 5pm to experience dinner and provide feedback on their experience and food from our culinary team." Featuring a mix of rotating artwork and vintage wines, MLG's is a friendly space with an artsy vibe. Lemonis will handpick each exhibit for the rotating art gallery on display in MLG Chicago, rotating every 60 days with new themes and complimenting food and beverages. The net proceeds of each new exhibit exclusively benefit a local charity. MLG features a newly constructed 30 foot bar housing over 70 craft vodkas, tequilas, scotches and whiskies, along with new signature cocktails to fulfill a wide range of flavors for any taste. A variety of local draft beers will also be on tap and diners can experience an expansive wine collection with over 500 bottles from Lemonis' personal collection. 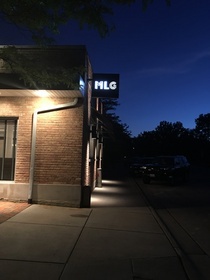 The MLG restaurant has three sections: a front bar where guests can enjoy more lively conversation and television, a main dining room for formal dining, and a spacious outdoor patio complete with umbrellas and cushioned seating. The new restaurant looks set to appeal to shoppers looking to relax, office workers and those who enjoy interesting food in comfortable surroundings. With good local parking, the MLG Restaurant would also make an attractive location for private parties. Located just a few short blocks north of downtown Lake Forest, MLG Chicago is a contemporary eatery that features a chic, lounge-like environment. Open seven days a week, MLG is located at 181 E Laurel Ave, Lake Forest, IL 60045. The restaurant is open Mondays thru Thursday from 11:30am to 10pm, Friday 11:30am to 11pm, Saturday 11am to 11pm and Sunday 11am to 9pm. Call 847.234.9660 for reservations, or visit www.mlgchicago.com. Like MLG's on Facebook @MLGchicago and Twitter @ChicagoMLG.